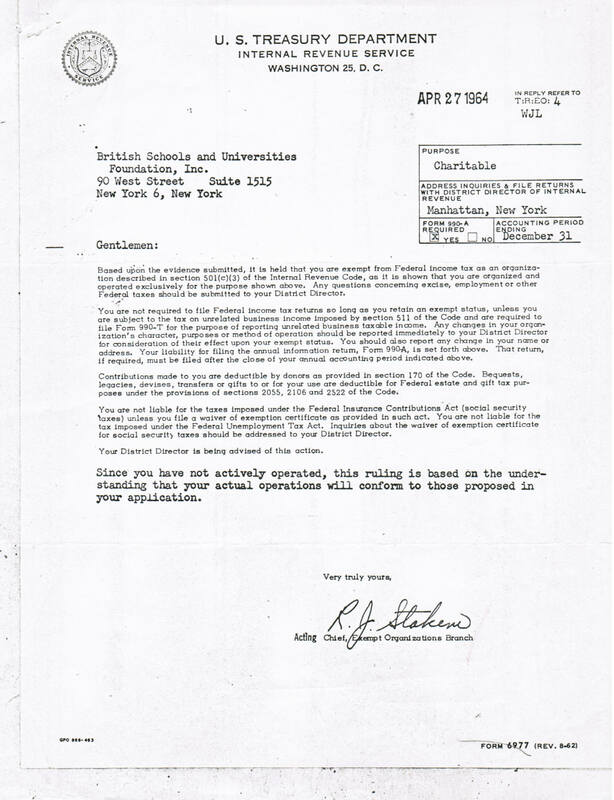 (1) British Schools and Universities Foundation, Inc. has been approved by the United States Treasury Department as an exempt charitable organization under Section 501(c)(3) and is classified as a domestic charity as defined in Sections 509(a)(1) and 170(b)(1)(A)vi) of the Code. An important facet of tax deductibility is based upon the following ruling of the US Internal Revenue Service "Contributions to a domestic charity ... which are solicited for a specific project for a foreign charity organization, are deductible under the section 170 of the Code ... where the domestic charity has reviewed and approved the project as being in furtherance of its own exempt purposes and has control and discretion as to the use of the contributions"
The applicant institution should be active in seeking financial support for specific projects which are clearly defined and documented. Acceptability of these projects should be demonstrated by the efforts of its graduates, alumni and friends who compromise the institution's constituency in the United States. A non-American institution should have a demonstrable record of cooperation with the United States either by acceptance of American students or by collaboration with comparable institutions in the United States. The Foundation's grants-in-aid are limited to institutions in the United States and countries of the British Commonwealth of Nations. BSUF's Federal Tax Identification Number is 13-6161189. Download BSUF's Tax Exemption Certificate.